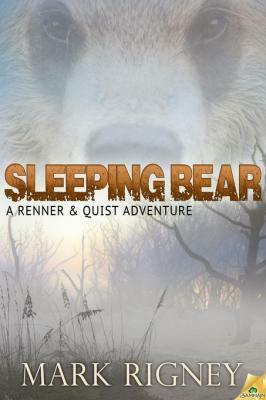 Samhain Publishing has just awakened Sleeping Bear, the second Renner and Quist adventure by Mark Rigney to see publication as an ebook. 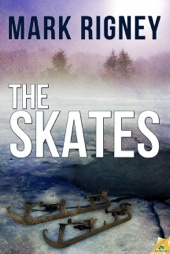 I discovered the series last year when the same publisher unearthed The Skates, a screwball quest involving tormented Victorian souls, a pair of magic ice skates, a ghostly hound, and dimensional time and space travel. For the benefit of newcomers, Renner and Quist are an odd couple double act comprising a stuffy Unitarian minister and a rather crude, sometimes boorish, ex-linebacker and former private eye, who team to solve occult mysteries in Michigan. This quirky series is surprisingly literate fiction that calls to mind Douglas Adams’s delightful Dirk Gently detective series. Rigney’s fiction is built around his characters’ faith (or their lack thereof) in the supernatural and preternatural. The series is thought-provoking as much as it is entertaining. This time out, Sleeping Bear finds Reverend Renner suffering through a crisis of faith as his attempts to minister at a local hospice have fallen on not just deaf ears, but unbelieving ones. It is at that point that Megan Jones enters his life. Megan is from the local Native American reservation that runs the casino and owns the camp grounds where Quist is employed as a manager. As her name suggests, Megan Jones and her tribe are almost entirely modernized. The pursuit of creature comforts has robbed her people of their customs and traditions. Megan suffers from epileptic seizures when she goes off her medication. The seizures take the form of nature visions that connect with her tribe’s long-abandoned creation myths. Quist manages a camp ground, but is a poor steward. Truthfully, Quist is a poor everything. He somehow manages to be likable despite being big, dumb, violent, and insensitive much of the time. Quist is a gun-rights advocate who hates political correctness and thinks the NPR-loving Renner is too sensitive to be a real man. Of course, differences aside, the two men care for each other deeply. They are both outcasts and both are in need of spiritual healing. It is Megan Jones, the outcast of her tribe, who can help them just as she helps put nature and a wounded bear back to rights. Part of what makes the series so enjoyable is Renner and Quist’s willingness to accept the inexplicable and simply go along with trying to restore order when supernatural chaos invades their reality. What makes Sleeping Bear stand out over The Skates is that Renner, Quist, and Megan all make mistakes. Renner and Quist’s biggest mistake is a common one in today’s world, failing to respect a wild animal for being exactly that. It is a mistake that costs two lives. I hesitate to call them innocent lives, but the loss is no less tragic in spite of the fact. Sleeping Bear isn’t a fable set to preach of the evils of our consumerist society and the need to return to the simple truths of the past, nor is it a call to turn away from secularism and embrace spirituality in any or all forms. Rather, Rigney’s remarkable story serves as a call to respect all things – the truth of old myths; the need to be good stewards to the earth and its creatures; the need to respect beliefs that teach us to comfort one another; the need to find healing and forgiveness for ourselves as well as others; and the need to accept those who are different and stop dividing our world over politics, religion, or our mental and physical capacity. I flat out love Rigney’s fiction for its quirky characters and the lessons they learn and I learn. I look forward to the publication of Check-Out Time, the third Renner & Quist adventure later this year. And somebody had better issue a print edition of the series soon because reading these on my laptop is just not good enough for a dyed in the wool traditionalist like me. I have the pleasure of reading a great deal of good new fiction each year – something that would never have happened if I weren’t writing this blog – but I cannot do enough to encourage my readers to check out Renner & Quist. It’s a series I can’t help loving and really is exceptional enough to deserve mainstream success. It may only be February, but I may very well have found my favorite book of the year. William Patrick Maynard was authorized to continue Sax Rohmer’s Fu Manchu thrillers beginning with The Terror of Fu Manchu (2009; Black Coat Press) and The Destiny of Fu Manchu (2012; Black Coat Press). The Triumph of Fu Manchu is scheduled for publication in June 2014.